BOSTON -John Messuri was brought to Arlington High to restore a once proud program to the elite of high school hockey in the Commonwealth. He succeeded on the biggest stage. Messuri’s Spy Ponders needed extra hockey against Central Catholic in the Super 8, and it only took 15 seconds of overtime before Mic Curran bounced the puck off a Central skate and into the net to send the Ponders into a frenzy and a 2-1 OT win to claim its first Super 8 title, the program's first championship title of any type since 1971. Arlington becomes the third public school to win the state’s top prize joining the 2008 Reading Rockets and 2010 Hingham Harbormen. 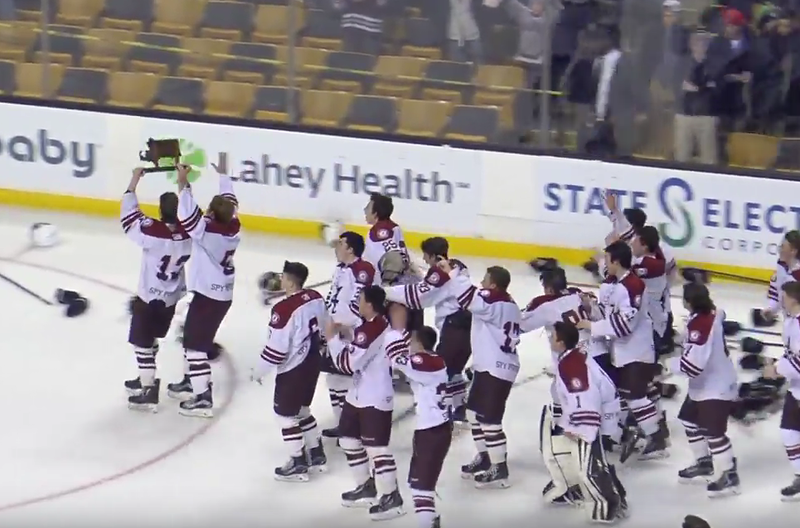 Curran’s goal, his second of the game, capped a game that will be remembered for its thrilling goalie duel between Arlington’s Jack Pinard and Central Catholic’s Matthew Pasquale. The game could have easily pushed towards 10 total goals, but the goaltenders stole the show throughout the game. Pinard, a junior, turned aside 22 shots in the win. The game almost went two periods without a goal but Kevin Ouellette found a wide open Curran with two minute left in the second period, and Curran wristed it home to put the Ponders on top. Central responded in the opening minute of the third when an errant Arlington pass found the stick of Central’s Joe Biddle in the slot, and Biddle fired it home to the game. In a time where prep schools and junior programs seem to always pluck the state’s best talent before they turn 16, the Spy Ponders flipped that idea on its head and stuck together. A strong senior core of Ouellette, Curran, Peter Scheschareg, Jeff McDonald, and John Pigott stayed all four years at AHS and now have the state title as their legacy. Messuri said that his pregame centered around everyone staying together for four years and having a chance to pay it off with a state title. For the players that came to Arlington, their legacy is in rebuilding the culture of the program. The Ponders had been to one state tournament, and didn’t win a game, in the five years prior to the seniors joining the team. Since then it’s been four tournament appearances, nine state tournament wins, and now the championship. Mike Jankowski took Central Catholic from a program with no history of any success and turned it into a consistent Super 8 participant. Kim Brandvold, Jankowski’s assistant, took the Raiders to the next level this season in making Central’s first ever state title game. While the ending was bitter for the boys on the ice, their lasting legacy in changing the Raider program will continue, especially with a strong group of young players like Will Winship and Sean Brown.